My fishing pole leans against the wall in the basement. It looks sort of lonely there. I am reminded that a leading psychologist said fishing was the best way to deal with stress and I wonder if I could grab the pole and go to the creek and swear the doctor prescribed it! I tend to be a natural bait fisherman: wax worms for trout, minnows and crawdads for bass, red worms or night crawlers for sunfish and worms or chicken livers for catfish. I also tend to like bank fishing, however I enjoy the fun of shooting through a rapids in a canoe and knowing you'll just get one cast into that backwater eddy at the end where the big brownie is lurking. And, I can't say I never use plugs. One summer day I took an assortment of "poppin' bugs" down to the river and spent a couple of hours catching sunfish on them. It was fun to watch the fast moving "V" in the water as the panfish raced for the topwater bait, smacked into it and took off. Fun always to reel the scrappy little bright colored fish in. Try this one with your kids. They'll be hooked on fishing forever. I've also used plugs for bass. The day I got disgusted and swore off it was several summers ago. I had gone to the river late in the afternoon and was fishing on the edge of dark. I cast across the river and went over a tree limb hanging above the water and there my plug dangled, inches off the surface. Suddenly this big mouth came out of the water. That's all I saw, just mouth big enough to swallow Jonah. Up it came and grabbed that plug then splashed back. Of course, with the line over a limb, I had no chance. Plug and fish were gone in seconds. 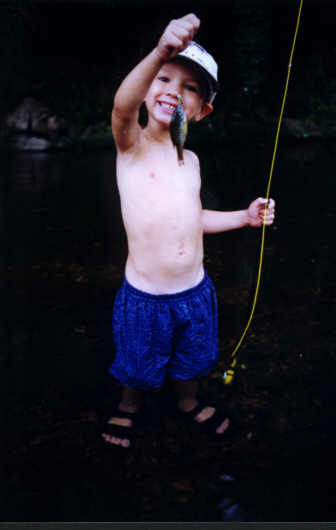 Nowadays, if I'm out to find some of those famous Ozark bass, I tend to float a minnow from the top of a riffle. It's the largemouth that seem to get the most notoriety when folks talk about local fishing, but we've got lots of smallmouth and spotted bass, too. I like catfishing at night and think a five gallon bucket and a lighter or matches are the essential equipment. You chuck your extra hooks, lighter and bait in the bucket and carry it to the river, dump it out, then turn it upside down and use it for a seat. The lighter is for building a campfire. These rivers have produced some monster catfish, but I'm always happy with a stringer full of the size that can be thrown in a frying pan. Of course, catfishing at night, sitting on an upturned bucket by a campfire, goes best with congenial company. Trout fishing around here is so internationally famous it hardly seems to need mention. With some world record rainbows and browns, and better then average size cutthroats and brook trout, folks flock in from all over to try it. Camping's the big attraction here, as far as I'm concerned. You need to be right there on the stream bank so you can be out in those wee small hours of the morning when you can't see a thing but can hear fish jumping everywhere. John boat fishing has virtually disappeared on the Buffalo but still holds sway on the trout streams. Hiring a guide is a wise choice. There's too much river and too many changes because of water level fluctuations for the brief visitor to really learn where and when to fish. Besides the big lakes everyone knows about, there are ponds and small lakes owned by the Forest Service in the area and regularly stocked with bass and catfish. These are usually good spots that don't get heavy traffic. Frog gigging and sucker grabbing are local favorites that visitors tend to miss but bullfrogs can be taken from April through December and the daily limit on suckers is 20 fish. And, speaking of rough fish, some of these waters produce some good-sized carp. A can of corn makes good bait, and catching a big one is fun. They're bony but good tasting and if you pressure-cook them you soften the bones enough to just ignore them. However you choose to spend your fishing time in the Ozarks, you get the added benefits of awe-inspiring scenery, healthful exercise, fresh air, and as much quiet and solitude as you want. No wonder it adds up to the best stress-buster around! Licenses are cheap, ranging from $10.50 to $32. Three, seven and fourteen day trip licenses are available for non-residents. An additional trout stamp is required. They are $5 for residents and $9 for non-residents. Pick up an Arkansas Game and Fish Commission booklet on regulations anywhere licenses are sold for complete information.